Is Now a Good Time to Invest in Public Storage? The storage facilities operator came under pressure in 2016. Is now the time to pull the trigger and buy shares of the stock? 2016 was a rough year for shares of Public Storage (NYSE:PSA). After rocketing to new all-time peaks early in the year, prices steadily declined and are still about 20% off of its highs as of this writing. The bleeding appears to have stopped, so some investors may be ready to jump back in on hopes of a rebound. While this could happen, the main reason to invest in Public Storage is for its dividend. Public Storage's stock has steadily risen over the long term. The company, which owns and rents out storage space, has benefited from rising real estate costs over time. However, the real reason for the gradual rise in share prices has been the dividend payment. As a real estate investment trust (REIT), Public Storage is required to distribute at least 90% of its taxable income to shareholders. 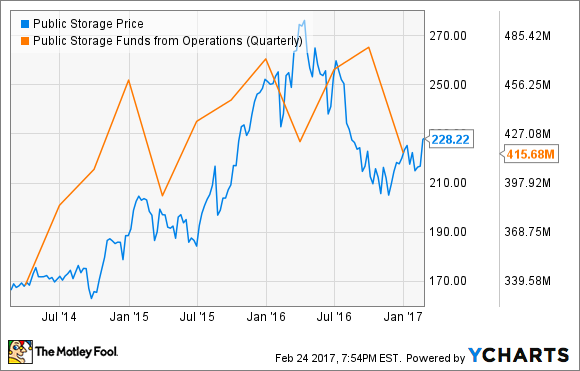 This is what makes REITs an intriguing option for investors looking for income. The company has delivered on those expectations. Not only has Public Storage paid a steady and attractive dividend, but the company has also increased paychecks to shareholders every year for about a decade. Since 1990, the payout has increased from a quarterly rate of $0.20 per share to the most recent payment of $2.00 that was paid back in December, representing an 8.9% annual growth rate. Public Storage has pulled this off by developing and buying new properties in busy urban markets in the U.S. and Europe, and has benefited from rising rental rates as well. However, the company has recently run into some headwinds. Much has been said in the media and among other talking heads about interest rate increases from the Federal Reserve. This has no doubt been a contributing factor to Public Storage's choppy share price movement in the last year, as the company, like most REITs, relies on debt as a primary means of funding growth. Luckily, Public Storage relies less on leverage than competitors, so this shouldn't hit the REIT's share price as hard as others in the space. 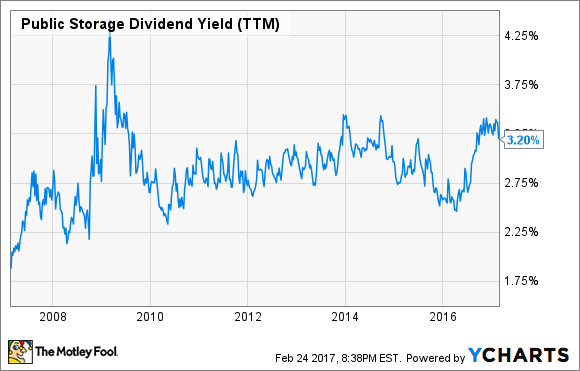 As rates rise, investors may also demand a higher dividend yield, which would contribute to lower share prices to drive yield higher. However, the primary reason behind recent stock movement has been the business itself. Demand for storage has been slowing down in some cities, especially in oil-based economies, while new storage supply is lacking in higher-potential areas like on the West Coast. Discounting and promotional activity has also put a damper on rental rate increases, all of which has put the brakes on revenue growth in the last year. The company posted strong funds from operations growth through the end of 2015, which helped fuel growth in the stock price as well. That growth has slowed to a more modest rate compared with previous years and share prices have come down off of the highs from early 2016 as a result. To fight back, the company expects to drop more money on advertising until business starts to pick up again. Advertising spend had been falling in the last couple years as new rental clients were walking in without a lot of effort on Public Storage's end. According to management, that trend in falling ad spend will reverse for at least a couple of quarters as the company's internet and television marketing presence will be increased. Public Storage is also still developing new properties in key areas. Through the last report covering full-year 2016, 55 facilities had been acquired and 16 more had been built. Management has indicated it plans to keep looking for attractive areas to build or acquire to help offset weakness in other areas. One area of weakness during the year was a 0.5% drop in occupied square footage to 92.3% occupied. This was offset by a 4.7% increase in rent per square foot, but management sees rent hikes slowing down with more supply from competitors hitting the market as of late. The storage industry is cyclical with ebbs and flows, and Public Storage historically has had fairly high retention rates, so it seems likely that this dip in occupancy is part of a normal fluctuation rather than a long-term problem. Additionally, the company's breakeven point is 30% occupancy, so a minor dip like this one is a drop in the bucket of profitability. When a stock's price drops, the dividend yield increases. Public Storage's dividend yield is currently close to the highest it has been in the last decade because of a drop in the stock's price caused by slowing growth and profit in 2016. In spite of short-term headwinds to growth, the company has been a resilient source of income for investors. The company has been able to keep occupancy high and rents increasing even with the current real estate market getting tougher to operate in. 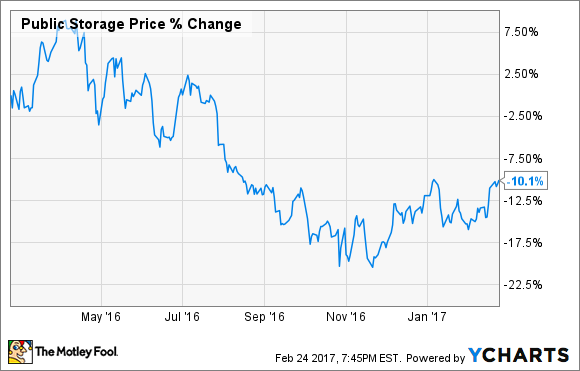 For investors looking for a high-paying dividend, Public Storage is worth consideration right now.